The New England Patriots are 6-2 and have a two-game lead in the AFC East. They won a road divisional game on Monday Night Football and have been victorious five games in a row. That’s the good news. The bad news is that they struggled, especially offensively to finish drives all night long and scored only one offensive touchdown. But in the end, they’ll take the 25-6 win on the road over the Buffalo Bills and move on. It was a very physical, hard-hitting contest throughout. The loss of Sony Michel was painfully felt by the Patriots offense as the Bills defense teed off defensively and their pass rush frequently had the New England offensive line on roller skates. The Bills entered the game with one of the better units in the league at creating pressure and they certainly did on Monday night. 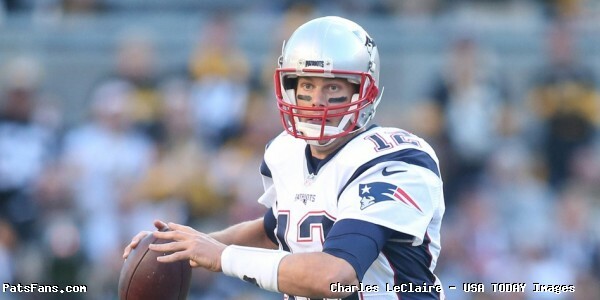 Tom Brady was under duress for much of the night. The Bills deep zones frustrated the Patriots ability to get vertical for much of the night and the wind conditions, which Brady said after the game, made quite a few throws flutter, would affect both teams ability to throw the ball deep. Prior to the game, there were reports from the NFL’s Ian Rapoport that WR Josh Gordon was late for the team walk-thru and would be punished by sitting out several series, possibly even the first quarter. However, once the game started, the Patriots got the ball first and Gordon was on the field. Which leads back to Rapoport, who is always very accurate with his reporting and not prone to sensationalism. Was this just a case where he got his information really wrong? Or was this a case of the Patriots using an Agent provocateur in trying to ferret out where the leaks are coming from at One Patriots Place? This will be interesting in how it plays out. Especially considering that Jay Glazer from Fox Sports reported on Sunday that the Pats were in the market “trying to go after a bonafide premium wide receiver, offering up high-draft choices for that.” Once the news of Gordon’s supposed tardiness broke, it seemed to fall into place. Now, it is just another puzzle that we aren’t likely to get an answer to anytime soon. The Patriots defense did their job, albeit against one of the worst offensive teams in the NFL but they held the Bills to just two field goals and outscoring them in the process. 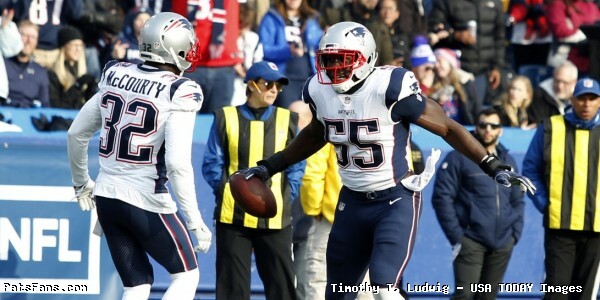 Devin McCourty intercepted a Derek Anderson pass and returned it 84 yards for a touchdown to seal the game. But it was Buffalo’s running game, that is what the team wanted to stop and they did just that. The Bills rushed for just 46 yards on 19 carries, excluding an Anderson kneel down at the end of the half, they averaged just 2.6 yards per carry on the night. LeSean McCoy had just 13 yards on 12 carries. Trey Flowers had an outstanding game, defending the run he was shooting gaps and was generally disruptive all night. Kyle Van Noy, filling in for the injured Dont’a Hightower was fantastic. Van Noy was all over the field, making seven tackles, had two sacks, forced a fumble and had two tackles for a loss as well. 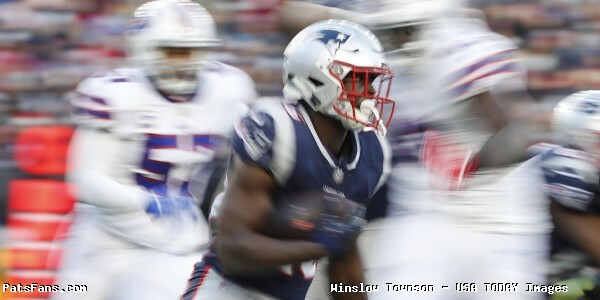 With Michel out, the Pats running back depth was woefully thin, they opted not to activate Kenneth Farrow off the practice squad and stuck with just two healthy running backs, James White and Kenjon Barner. But they moved Cordarrelle Patterson to tailback for this week’s game and he logged a game-high amount of carries (10) and yards (38) on either team. Patterson isn’t going to make anyone forget Barry Sanders but gets high marks for stepping up and being a team-first guy when and where they needed him to. The Patriots had three good drives in the first half but couldn’t finish any of them. On their first possession, facing a 2nd and 14 from their 34, Brady went deep to Gordon but the ball fluttered and came down short. Gordon, who had his coverage beat, tried to come back for it but missed it and a golden opportunity. It was that kind of night. On their second drive, they drove to Buffalo’s five-yard line but stalled and had to settle for a Stephen Gostkowski field goal. They scored on three consecutive drives but stalled on each and Gostkowski gave them a 9-0 lead. They were moving the ball but Buffalo’s defense was doing a great job of bending but not breaking. After the Bills responded with a field goal to narrow it to 9-3, the Patriots drive in the final two minutes would stall out again. But this time, Gostkowski’s 51-yard field goal would drift to the right and was no good. After the team’s traded field goals in the second half to make it 12-6, the Patriots put together their best drive of the game and drove 85 yards in 10 plays for a touchdown, converting a couple of key third downs. Facing a 3rd and 6 from the Patriots 19, Brady uncorked a laser down the left side to Julian Edelman for 26 yards. Then facing a 3rd and 8 at the Patriots 47, Brady found James White who promptly juked a defender and got nine. Patterson had a nice 22-yard run before Brady hit Chris Hogan down to the Bills one-yard line with another nice throw. From there White powered it into the end zone and it was 18-6. The Bills drove to the Pats 25 and nearly scored but Jason Croom dropped the ball in the end zone. After a false start, Anderson got fooled and when he tried a deep pass down the middle, Devin McCourty, playing deep safety, read Anderson’s eyes and jumped the route perfectly picking it off and rolling 84 yards for a game-sealing touchdown. That made it 25-6 and that was all she wrote. Julian Edelman– The Patriots pound for pound toughest wide receiver had a very good game and his best since his return from his ACL injury and subsequent suspension. Edelman was the main recipient for Brady’s passes as the Bills were playing those deep zones and keeping everything in front of them. Edelman was very productive, catching 9 passes for 109 yards but also paid the price Monday night as he took several big hits. That 26-yarder down the right sideline, got the Patriots going for their only touchdown drive of the night. Edelman’s grit and toughness were missed during his absence, and on a night like Monday night, he was a big factor in the team being able to move the ball. Kyle Van Noy- As we mentioned above, with Hightower out, Van Noy was going to have to step up. And he did. Van Noy was making plays all over the field, logging in a pair of sacks, a forced fumble and two tackles for a loss. He was very active and the underrated Van Noy showed his versatility off on Monday night with a big, big performance. James White- The Swiss Army Knife of the Patriots defense, along with Edelman accounted for the vast majority of the Patriots offense. It was no coincidence with the game still on the line in the fourth quarter that White and Edelman were the choices by Brady to keep the drive alive. He and Edelman accounted for 211 yards of the Patriots 387 yards of offensive output. Another big game for White who caught 10 passes for 79 yards. Running Game- The Pats running game which had been so impressive the past month with no Sony Michel was mired in neutral all game long. The Bills bottled them up all game long until the big Patterson run for 22 yards during the lone touchdown drive. This isn’t a knock on Patterson, who was playing out of position and did as well as anyone can expect given the circumstances, but if Michel is going to miss more time, then the team really needs to explore the possibility of bringing in another back. Play calling- We may be a little nitpicky here because we thought Josh McDaniels made some creative play calls during the game, but at other times, we thought they made some mistakes. After the Bills had hemmed the Patriots deep with a punt and penalty on Edelman, the Pats faced a third down and three at their own 12-yard line. They lined up to run Patterson in a power formation, something the Bills were just sitting on. The attacked it and blasted him down for a one-yard loss. That directly led to the Bills second field goal of the game. No Killer Instinct- The Patriots made this game much tougher on themselves than they had to for three and a half quarters. They had plenty of opportunities to put the Bills in the rearview mirror where Buffalo’s lack of offense would have put them in a bad place. But they couldn’t finish drives and they had to scrap and fight right up until the final 4-5 minutes. Give the Bills a ton of credit, their defense played superbly and they were hitting hard all night long. But this team is better than that and left far too many points on the field. Learn from it, file it away for the next time the teams meet and move on. 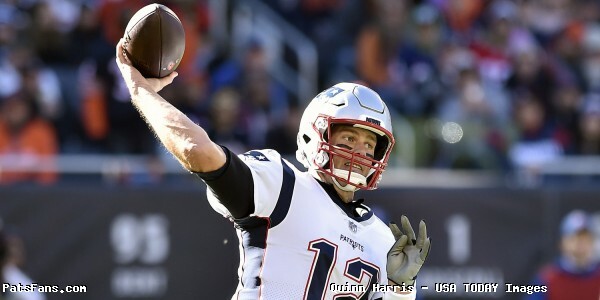 This entry was posted in 2018 Patriots Regular Season, NFL Commentary, NFL News, Patriots Commentary, Patriots Film Room, Patriots News and tagged 2018 NFL Season, 2018 Patriots season, Bill Belichick, Buffalo Bills, Chris Hogan, Cordarrelle Patterson, Derek Anderson, Dont'a Hightower, James White, Julian Edelman, Kyle Van Noy, LeSean McCoy, New England Patriots, NFL, Patriots, Patriots edge rushers, Rob Gronkowski, Sony Michel, Stephon Gilmore, Tom Brady, Trey Flowers on October 30, 2018 by Steve Balestrieri. 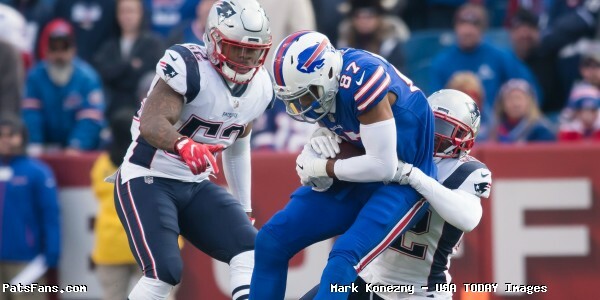 Patriots-Bills Week 8, Key Matchups, Who Has the Razor’s Edge? 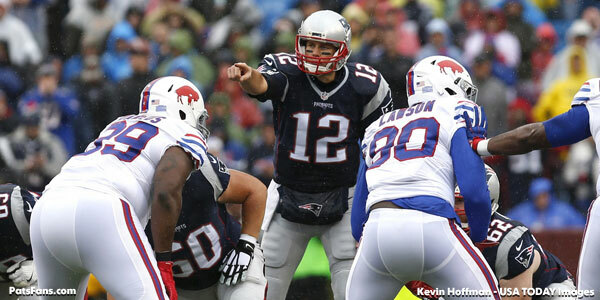 The New England Patriots are heading off to Buffalo and facing the Bills in a prime-time Monday Night Football matchup. They have a chance to enter the halfway point of the season at 6-2, which is pretty impressive considering the 1-2 in September. This week’s game will be broadcast by ESPN and can be seen locally on WCVB-TV Channel 5. Joe Tessitore will handle play-by-play duties with Jason Witten as the color analyst. Booger McFarland and Lisa Salters will work from the sidelines. The game will also be aired on the Patriots flagship radio station 98.5 The Sports Hub with Bob Socci and Scott Zolak on the call, produced by Marc Capello. The Patriots (5-2) defeated the Bears on the road 38-31 last Sunday in a rare 1:00 p.m. start. They’ve won four in a row. The Special Teams scored 14 points on a blocked punt returned for a touchdown and a 95-yard kickoff return. Tom Brady threw for 277 yards and three touchdowns. The Bills (2-5) lost to Indianapolis Colts 37-5. Derek Anderson, the 14-year veteran took over for the injured Josh Allen and threw three interceptions and also had a fumble as the Buffalo offense continues to struggle. The Patriots and the Bills are meeting for the 117th time and the Patriots have dominated overall 72-43-1. But since Bill Belichick took over in 2000, the Patriots have won 31 of 36 games between the two teams. Tom Brady’s record against the Bills in games where he’s started and finished the game is 28-3. With a win on Monday Night, he will become the QB with the third most wins in Buffalo behind only Jim Kelly and Joe Ferguson. The Patriots running game has been outstanding for the past month but they lost Sony Michel who has been the catalyst behind it all, to a knee injury against the Bears last week. The Bills have been good defensively, their issue has been the defense has been on the field far too long this season. They allow an average of 110 yards per game and have the big men inside, Star Lotuleilei, Kyle Williams, Jordan Phillips, with LBs Tremaine Edwards, and Lorenzo Alexander to make things difficult. The Pats will go with James White and Kenjon Barner again this week but without Michel the running will be a bit harder to come by. They’ll look to pass first to get the running game going this week. The Colts gashed the Bills on the ground last week, so that will bear some watching here. The Patriots passing game is looking more and more potent and last week, they were going much more vertical in their passing concepts than we’ve become used to. The good news is that Rob Gronkowski is expected to be back for this week’s game and his presence helps out the offense attacking the middle of the field. The Bills pass defense is their strength and have not allowed a 300-yard passer in 15 consecutive games dating back to last year. The pass rush is improved with Jerry Hughes having a solid season and a very good secondary. The Bills have two good safeties in Jordan Poyer and Micah Hyde which will bear watching as the middle is where the Patriots like to attack offensively. Look for Tom Brady to continue targeting Josh Gordon more and with him matched up with Bills talented corner Tre’Davious White, it promises to be a great matchup to watch. But with the outside receivers going more vertical, it should open things up for the Pats to work underneath with Julian Edelman and James White. The Bills have a pair of talented running backs that New England knows well in LeSean McCoy and Chris Ivory. McCoy has been in the concussion protocol but will probably play this week. It will be interesting to see how Offensive Coordinator Brian Daboll who knows the Patriots well will look to attack this week. The Patriots run defense has been much better of late during the four-game winning streak. Last week’s numbers were skewed by scrambles by QB Mitch Trubiski who ran for 81 yards. Bears running backs averaged less than 3 yards per carry. With their passing game dormant, the Bills need their running game to give them a boost and help get things jump-started. This will be a big matchup for the interior linebackers (Dont’a Hightower and Elandon Roberts) this week. Hightower showed up on the injury report with a knee injury so that will bear watching. The Bills passing game is a total mess right now averaging a league-low 129.4 yards per game thru the air. Top draft pick Josh Allen won’t play this week, he’s down with an elbow injury and journeyman Derek Anderson gets the nod. But the real problem is the Bills offensive line, which has been porous, allowing 29 sacks thus far. The Patriots pass rush has to be a difference maker this week. Zay Jones, Kelvin Benjamin, and tight end Charles Clay are decent enough weapons, but no Bills QB has had time to throw. The Patriots pass defense has been good with the cornerbacks covering wide receivers but they’ve had far too many breakdowns in the safety play, allowing big plays. They’ve also had issues containing mobile QBs which shouldn’t be an issue this week. The Patriots seemed to have turned the corner in their special teams play last week. Patterson returned one kickoff for 95 yards and a touchdown. In the second half, he nearly had another, going 38 yards and almost breaking it again. The Patriots also had a punt block for a touchdown, and with Stephen Gostkowski and Ryan Allen, they have a very solid kicking game. The Bills had a punt blocked against Houston and had their own issues with muffing punts and kickoff returns. We will finally get a chance to see punter Corey Bojorquez on the field after he spent all of training camp with the Patriots. He and kicker Stephen Hauschka are solid, but the Pats get the nod here. This one will require the Pats to get off to a good start. Buffalo hasn’t hosted a Monday Night Football game in a long time. The place will be rocking and the Bills will be looking to start quickly and get the crowd even more amped (lubed?) up. The Patriots should take a page out of the Bills opponents this year, they’ve outscored Buffalo 110-40 in the first half. They need to start fast, get the people sitting on their hands and force the Bills to have to rely on Anderson to get them back in the game. This entry was posted in 2018 Patriots Regular Season, NFL Commentary, NFL News, Patriots Commentary, Patriots News and tagged 2018 NFL Season, 2018 Patriots season, Bill Belichick, Buffalo Bills, Charles Clay, Chris Hogan, Chris Ivory, Derek Anderson, Dont'a Hightower, James White, Julian Edelman, Kyle Van Noy, LeSean McCoy, New England Patriots, NFL, Patriots, Rob Gronkowski, Stephon Gilmore, Tom Brady, Trey Flowers, Zay Jones on October 26, 2018 by Steve Balestrieri. The Patriots took care of the Bills again and won by 21, but it wasn’t as easy as the score would indicate. Buffalo had a much better game plan this time around and played hard. The score was very close until about midway thru the fourth quarter when the Pats pulled away. This one had more controversy as Kelvin Benjamin appeared to snag a go-ahead touchdown just before the end of the half. The referees signaled a touchdown but the league’s replay officials, (which took forever) decided it wasn’t a catch. Whether you believe it was a catch or not, it certainly appears that the league’s officials in New York are adding to the problem with over-analyzing these things rather than simplifying them. But in the end, the Bills with an extra four points or not, couldn’t stop the Patriots or Dion Lewis and New England scored on six straight possessions. Tyrod Taylor and the Buffalo offense weren’t going to match that and the Pats win assured them of their eight straight 12-win season and a first-round bye in the playoffs. So, we’ll start with the offense and the players can come forward to pick up their grade sheets. Tom Brady much like the first game in Buffalo wasn’t sharp in the early going, before getting it going in the second quarter and beyond. He was late in throwing a slant to Kenny Britt which resulted in a Jordan Poyer pick-six and a 10-3 Buffalo lead. He threw well behind Rob Gronkowski and then overthrew him on passes where he was wide open. But he quickly found his game. After the pick-six, the Patriots would outscore Buffalo 34-6 and Brady began heating up. He didn’t throw an incompletion in the second half and ended up 21-28 for 224 yards with 2 TDs and an interception. No James White, no Rex Burkhead? No problem. Dion Lewis, the guy whose name former Bills coach Rex Ryan claimed he didn’t know slashed Buffalo again. Lewis headlined a Patriots ground game that gashed the Bills for 193 yards. The Patriots knew the Bills were selling out trying to stop Brady from throwing and had a slew of smaller defensive backs in to stop the pass. The Patriots ran right at this group with deadly effect. New England ran for 191 the first time the teams played and 193 on Sunday. Lewis led the way with 24 carries for 129 yards and two touchdowns. In two games against the Bills, this season Lewis ran for 221 yards. It is safe to say they know his name now. The wide receivers again this week were pretty much a non-factor in the game. Buffalo’s secondary as we said, tried to take them away by flooding the field with DBs and it worked for the most part. NE’s wide receivers had a combined 7 catches for 87 yards. Danny Amendola had three catches for 28, Phillip Dorsett had one catch for 24 yards, newcomer Kenny Britt had just one reception for 16 yards and Brandin Cooks had just two receptions for 19 yards, but he did draw a 49-yard pass interference penalty. Rob Gronkowski was a big factor in the passing game catching five passes for 67 yards including a sick 17-yard touchdown grab. Running a go route down the left sideline, Brady threw a back shoulder pass that Gronk snagged one-handed and was able to get both feet down for a highlight reel touchdown. He also drew a couple of pass interference penalties on the Bills as well as producing his normal stellar work in the running game. Dwayne Allen had two catches for 26 yards while Jacob Hollister had a catch and a run for five yards each. On his run, if he stayed with Gronk and Allen to the outside, he had a touchdown. But he cut back inside and was tackled on the three. The offensive line’s play was very good this week, especially in the passing game. Brady was sacked twice but was only hit on two other occasions. He worked from a clean pocket for most of the day. The running game was on point again as the offensive line was winning the battles there and opened up big holes for Lewis to exploit. They were getting to the second level and keeping the linebackers off the runners. The Patriots set the pace and dictated how the game was going to be run. It was a good day for the Patriots front seven especially the defensive line. The Bills ran for just 84 yards on 24 carries, a 3.5-yard average. LeSean McCoy had the lion’s share of that with 17 carries for 71 yards. He had a nice 18-yard run on the edge, but the longer the game went on, the better the run defense got especially inside. The Patriots sacked Taylor six times and had 11 tackles for loss. Marquis Flowers had a big, big day as he notched 2.5 sacks and had three tackles for loss and three QB hits in the Bills backfield. Elandon Roberts shared a TFL with Eric Lee but this week, there weren’t the glaring errors with misses and filling the wrong gaps as the linebackers were prepared and stepped up. Especially with Flowers who has always been known as a STs guy but had a career-type of a day that was an unexpected bonus. After having their best day of the year the last time the teams played, the New England secondary had its issues all day long with the Bills receivers. Kelvin Benjamin is a beast. Even on one leg, (he needs MCL surgery after the season), the 6’5, 243-pound Benjamin gave Stephon Gilmore fits. The Bills were high-pointing the ball or allowing Benjamin to use his body to screen off Gilmore where he had five catches for 70 yards. But at least he was there with him all day. Malcolm Butler had an awful day against Deonte Thompson who had Butler turned all around a few times with four catches for 91 yards. Butler was caught biting on a double move and just had a rough day all-around. Shady McCoy had five catches for 76 yards, with most of it coming on an outstanding 39-yard run where he caught a screen pass at the line of scrimmage and weaved and faked his way thru the Patriots secondary down to the 10-yard line. Pat Chung did a pretty decent job on Charles Clay and Devin McCourty was solid in the back end but it wasn’t the greatest day for the secondary as a whole. But they were bailed out a few times by Taylor’s poor decisions to not throw the ball away, where he took horrible sacks and by curious decisions by the Bills coaching staff. No worries here, Stephen Gostkowski was perfect in his four extra points and three field goals. His kickoffs as always are spot on and allowed the Patriots coverage units to do a great job of limiting the Bills return game. Ryan Allen punted only once for 44 yards with no return. Buffalo’s coverage units also had a very solid game. Special Teams play only played a key role in the Bills’ missed 50-yard field goal. Bill Belichick had the team coming home after a long road trip and a particularly emotional win over the Steelers. Although they started slowly, the team was prepared and they had a good game that was executed well. As always, the Patriots halftime adjustments were outstanding, outscoring Buffalo 24-3 after the break. Josh McDaniels’ offense was missing Julian Edelman, Malcolm Mitchell, Martellus Bennett, Marcus Cannon, Rex Burkhead and James White. And they still scored 37 points without a big turnover from the defense. That was their second highest output of the season. And for all the hand-wringing about the Patriots defense, Matt Patricia’s unit gave up a total of nine points on just three field goals, the only touchdown the Bills scored in two games this season was by their defense. While it was neither perfect nor pretty, it was still effective. This entry was posted in 2017 NFL Season, 2017 Patriots Season, NFL Commentary, Patriots Commentary, Patriots News and tagged 2017 Patriots Season, Bill Belichick, Buffalo Bills, Chris Hogan, Danny Amendola, Dion Lewis, James White, Julian Edelman, Kelvin Benjamin, LeSean McCoy, Malcolm Butler, New England Patriots, NFL, Patriots, Patriots edge rushers, Rob Gronkowski, Tom Brady, Trey Flowers, Tyrod Taylor on December 26, 2017 by Steve Balestrieri. The Patriots return home for the final two regular-season games of the 2017 NFL Season. They’ve been on the road for five of the last six weeks and finished that difficult part of their schedule 5-1 and although injuries have ravaged the team, are in prime position to win the top seed in the AFC. If the Patriots take care of business the right way, they won’t have to leave Gillette Stadium again unless they travel to Minneapolis. This week’s game will be broadcast by CBS on Sunday, December 24 at 1:05 p.m. and can be seen on WBZ-TV Channel 4. Jim Nantz will handle play-by-play duties with Tony Romo as the color analyst. Tracy Wolfson will work from the sidelines.The game will also be aired on the Patriots flagship radio station 98.5 The Sports Hub with Bob Socci and Scott Zolak on the call, produced by Marc Capello. The Patriots (11-3) are coming off a stunning 27-24 win over the Pittsburgh Steelers on the road. The Patriots scored the final 11 points of the game and then had to make a stand inside the 10-yard line where Duron Harmon intercepted Ben Roethlisberger to seal away the win. The Bills (8-6) have won two in a row since losing to the Patriots on December 3 and last week beat Miami 24-16. If the playoffs started today, the Bills would be the #6 seed in the playoffs as they hold the tie-breaker with the Ravens. The Patriots and Bills history go back to the earliest days of the AFL in 1960. Sunday will mark the 116th meeting between the two franchises. Overall the Patriots hold a 71-43-1 edge, including a 36-21 at Foxboro. The Patriots have dominated in the Bill Belichick era, taking 30 of 34, and since Tom Brady became the QB of the Patriots, the Bills have only beaten NE in Foxboro once, in the season finale in 2014. New England rested many of their starters and Brady played only the first half. The Patriots running game had one its best games of the year against the Bills a few weeks ago, rushing for 191 yards with Dion Lewis leading the way with 92 yards and Rex Burkhead with a pair of touchdowns. Lewis will probably continue to get the lion’s share of the carries with James White and possibly Mike Gillislee getting some work this week. The offensive line did a good job in the running game three weeks ago. Buffalo’s run defense has been as problematic as the Patriots have. The two teams have nearly the identical yards per game average allowed on the ground. Last week, Miami ran 21 times for 100 yards. Look for New England to run the ball hard again at the Bills front seven. Lewis is having a fantastic year and has taken over the top back slot in the New England offense. They’ll miss Burkhead who’ll be out until at least the playoffs begin and hopefully have him back by the divisional round. Gillislee, having been a healthy scratch for a month and a half, could play a key role this week. The Patriots passing game is banged up at the wide receiver position. Chris Hogan missed last week’s game with a flare-up of his shoulder injury. Hopefully, he’ll be back this week to go along with Brandin Cooks, Danny Amendola, newcomer Kenny Britt and Phillip Dorsett. But the wildcard is Rob Gronkowski. He torched the Steelers for nine catches for 168 yards last week. Three weeks ago against the Bills, he had nine catches for 147 yards and despite being held on a few plays that went uncalled, was the big “X” factor of the game. James White and Lewis add to the weapons that can be brought to bear in the passing game. Buffalo’s pass defense has created a ton of turnovers. Last week, they forced four fumbles against Jay Cutler and picked him off three times. Led by Tre’Davious White, they’ve stiffened their pass defense on the perimeter. Safeties Micah Hyde and Jordan Poyer have made a tremendous difference in the middle of the field. Look for Brady to spread them out and look for favorable matchups. Last time Cooks was held to just 17 yards on two catches. That isn’t going to get it done. Look for Brady to get him involved early. Britt could be a factor in the red zone and of course, Gronkowski remains the man the Bills have to stop. Brady will look for him to attack the seams. If Hogan is recovered from his setback which was supposedly related to a bad reaction to meds, it will be a big bonus for the offense. The Bills running game goes thru LeSean McCoy and the last time the teams played, he ran for 93 yards on just 15 carries. But once the Bills fell far behind, they had to abandon the running game in an attempt to catch up. Look for McCoy to get a lot of looks early in this one. Buffalo will be taking a page out of the Pittsburgh playbook and try to keep Brady and Co. on the sideline. 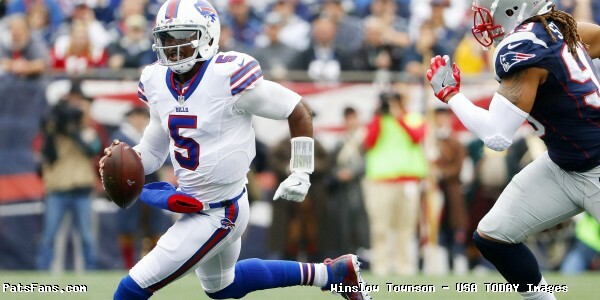 Tyrod Taylor is always a threat to run and can keep the chains moving with his feet. The Patriots depleted front seven continues to struggle badly against the run. No Dont’a Hightower, Alan Branch and Kyle Van Noy among others have left them struggling for solutions. Branch is definitely out this week and it remains to be seen if Van Noy will be ready to come back although he was seen practicing…with the secondary this week. Look for the Bills to test the Patriots at the edge, where they’ve been really struggling. Eric Lee has been targeted by opponents as well as Deatrich Wise. Without Van Noy, the edge has been a sore spot. Linebackers David Harris, Elandon Roberts, and Marquis Flowers have to do a better job at run support. Buffalo’s passing game (171.2 YPG average) is predicated on getting the running game going and then having Taylor roll out and make plays with his feet. His two biggest targets are McCoy out of the backfield and tight end Charles Clay. The production from Kelvin Benjamin who’s been hurt and Zay Jones has been inconsistent. The Patriots pass defense, specifically their secondary has been much better the second half of the season. It will be interesting to see how the Patriots opt to defend McCoy this week. Look for Pat Chung to draw Clay. In the last matchup, they held Taylor and Nathan Peterman to 82 yards net passing. Look for the Patriots to try to contain Taylor in the pocket. Early downs will tell the tale here. If the Bills are in third and long, their offense will struggle big time having to pass for their first downs. They’ll be looking for those third and short where Taylor can run/pass option for short gainers. The Patriots’ Stephen Gostkowski is having an excellent 2017 season, his extra point miss last week was the result of a rare bad snap/hold from Joe Cardona and Ryan Allen. But his kickoffs and outstanding coverage have pinned opponents deep all season. The Bills Special teams have been good, but not great. Stephen Hauschka has had a very solid season Colton Schmidt has a 44.4 yard average with a 40.6-yard net. The punt coverage units are very solid. This one has playoff implications for both teams. If the Patriots win this week and next, they’ll have home-field advantage for the playoffs as the AFC’s #1 seed. Buffalo is the #6 seed right now and would break their streak of no playoff years at 17. They are tied with but hold the tiebreaker with Baltimore. Tom Brady has only lost to the Bills at home once, in the 2014 finale with most of the starters sitting and Brady playing a half. Overall since 2000, the Bills have won in New England only twice, in 2014 and last year against 3rd string QB Jacoby Brissett. That is a huge obstacle standing in front of them. This entry was posted in 2017 Patriots PreSeason, NFL Commentary, Patriots Commentary, Patriots News and tagged 2017 Patriots Season, Bill Belichick, Buffalo Bills, Charles Clay, Chris Hogan, Danny Amendola, Dion Lewis, Dont'a Hightower, James White, Jordan Poyer, LeSean McCoy, Malcolm Butler, Micah Hyde, New England Patriots, NFL, Patriots, Patriots edge rushers, Rob Gronkowski, Tom Brady, Tre'Davious White, Trey Flowers, Tyrod Taylor, Zay Jones on December 22, 2017 by Steve Balestrieri. The Patriots took care of business in Buffalo on Sunday afternoon using a running game that gashed the Bills for nearly 200 yards behind Dion Lewis and Rex Burkhead and the defense which held the Bills woeful passing game to just 85 net yards and three points. Rob Gronkowski had nine catches for 147 yards and was uncoverable. He also committed a stupid, flagrant cheap shot after the whistle in the fourth quarter that will cost him. If he serves his one-game suspension, he’ll probably miss out on the final of his bonus incentives in his contract which will be expensive. 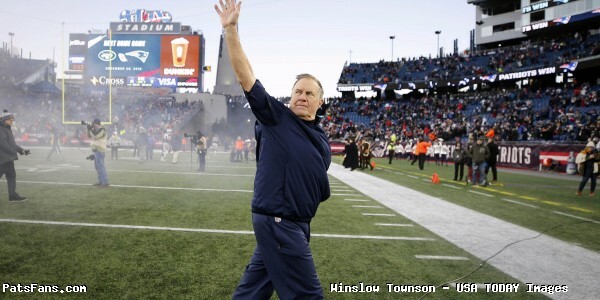 Simply put, the Patriots outplayed and outcoached the Bills again. Brady improved his record to a ridiculous 27-3 against the Bills and the team clinched a virtual tie for the division. Any Buffalo loss or New England win in the next month clinches the division again for the Patriots. Every spring and early summer we hear the “will this be the year that the Patriots are dethroned in the AFC East?” and this season, even after a slow start, it is essentially wrapped up with four games to go. With the win, they improve to 10-2, and more importantly, they keep the pressure on the Steelers who will have to win against Cincinnati later tonight to keep pace as the top team in the AFC. Tom Brady wasn’t sharp, especially in the first half but he and the team heated up in the third quarter and they scored on two impressive drives and put this one away early. Brady ended up with pedestrian numbers (for him), 21-30, 258 yards with zero touchdowns and an interception. The pick was the play that Rob Gronkowski was flagged and suspended for and should have been a penalty (two actually) on TreDavious White. But Brady missed a wide-open Phillip Dorsett on a deep incompletion to Brandin Cooks, which ignited a mini-brouhaha with Josh McDaniels, but he made a couple of really nice throws to Gronkowski. Brady also slides in the pocket and steps up better than anyone in the business. He has the innate ability to feel the rush and when to step up and slide left or right. The Patriots two-headed monster of Dion Lewis and Rex Burkhead gashed the Bills defense badly. A week after holding the Chiefs to less than 60 yards on the ground, the Patriots ran for nearly 200 yards. Burkhead ran 12 times for 78 yards with two scores and added three catches for 25 yards in the passing game. Lewis ran 15 times for 92 yards. Each broke a long gainer as the running game and the Bills were powerless to stop them. James Develin and James White both were pressed into support status this week but each played a role and the Patriots running game is getting better and better each week. White had five carries for 18 yards and four catches for 32 more. Not bad production for the third man in the rotation this week. The wide receivers this week were a non-factor in the game. Buffalo’s secondary did a great job of bottling them up and taking away the deep chunks and the sideline routes of the wide receivers. Brandin Cooks had just receptions for 17 yards, Danny Amendola had just two catches for 34 yards. Dorsett wasn’t targeted, however, he was wide open for that big gain where Brady missed him all alone down the left sideline. Rob Gronkowski once again tortured the Bills defense in Buffalo. He caught fire in the second half and they don’t have anyone that can match up with him. He caught nine passes for 147 yards despite being held and hit downfield on seemingly every snap. But what followed after the pick was inexcusable. We get that the frustration of seven years is taking its toll on the big guy, but he frankly has to be smarter than that. And while part of the blame has to fall to the referees who let every team clutch and grab Gronkowski on every down, while if he breathes on an opponent an OPI flag is thrown, it doesn’t excuse what he did…at all. Nuff said. Dwayne Allen had one catch for three yards but has really improved in his run blocking and provided good support in the running game. Jacob Hollister had one target in the passing game and plays a regular role on Special Teams. The offensive line was missing right tackle Marcus Cannon again as well as swing tackle LaAdrian Waddle and had Cameron Fleming in there this week. Center David Andrews returned this week. The pass protection was a bit iffy this week again. Buffalo, who came in with just 17 sacks, had three on the day and was getting good pressure on Brady. The running game was clicking again. The Patriots offensive line was winning the battles there and opened up big holes for the backs to exploit. They were getting to the second level and keeping the linebackers off the runners. It was a mixed bag for the offensive line who gave up a whopping 183 yards to LeSean McCoy, Tyrod Taylor et al. but it seemed every time they needed a big stop they were getting it. McCoy had just 30 yards in the second half. And the Bills ended up with a total of three points in their own building. The pass rush was once again very good, the Patriots were getting a good push from everywhere. Malcom Brown had a really solid day in his return from injury with a sack, a pair of quarterback hits and a couple of run stuffs. Kyle Van Noy who injured his calf in the game against Miami, seeming re-aggravated it in the third quarter and didn’t return. He did have a half sack, a QB hit, and a pass defensed. Elandon Roberts and David Harris had some issues in run support this week, as they got washed out on a few of the Bills running plays. They struggled a bit in pass coverage as well. Harris had some good pass rushes in the interior and had 1.5 sacks and a QB hit. Stephon Gilmore had an outstanding day again. The Bills tried to attack him in his return to Buffalo this week. It failed miserably. Gilmore blanketed Zay Jones all day. Overall the Patriots secondary was outstanding. Buffalo had just 115 yards passing with a net of 85 and 3.4 yard per pass average. The Bills longest play of the day thru the air was 14 yards. Tyrod Taylor, Nathan Peterman, and Joe Webb were a combined 15 -34 for 115 yards. The Patriots secondary had their best game of the year. And the good news was that they got Eric Rowe back in the lineup after missing seven weeks with a groin injury. Rowe shook off the rust and had a pass defensed. There wasn’t a heckuva lot to complain about here. Stephen Gostkowski is on a roll, he kicked all three field goal attempts despite having the wind be a factor in the kicking game. His kickoffs and the resultant excellent coverage by the Special Teams units kept Buffalo deep in their zone all day. Newly signed Bernard Reedy returned one punt for 11 yards and Geneo Grissom replaced Nate Ebner on the STs roster. For a unit short Ebner, Trevor Reilly and Matthew Slater, they didn’t miss a beat. Bill Belichick raked Sean McDermott over the coals in their first AFC East meeting on Sunday afternoon. McDermott didn’t come off remotely ready to challenge the Patriots for the division and when they needed to come up with an answer, they chose the Wildcat. That’s how you’re going to beat Belichick and the Patriots? By running the Wildcat? The team was focused, ready to go and had a good game plan that was effectively put into operation. Josh McDaniels stayed patient with the running the football, and they took what was there. Matt Patricia’s unit gets high marks on Sunday. Buffalo’s best drive was their first one, and they came away with zero points.Overall very good marks for the Patriots. We’re on to Miami. 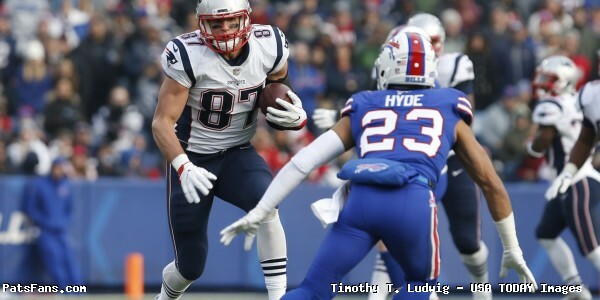 This entry was posted in 2017 Patriots Season, Patriots Film Room, Patriots News and tagged 2017 Patriots Season, Bill Belichick, Buffalo Bills, Danny Amendola, Dion Lewis, Eric Lee, James White, LeSean McCoy, Malcolm Butler, New England Patriots, NFL, Patriots, Patriots edge rushers, Rex Burkhead, Sean McDermott, Stephon Gilmore, Tyrod Taylor, Zay Jones on December 5, 2017 by Steve Balestrieri. The Patriots and Buffalo Bills will meet for the first time in 2017 on Sunday in Buffalo as the schedule makers don’t have the division rivals face each other until December. The rivalry has gone back and forth but the Bills have had a nightmarish record against the Patriots in the Bill Belichick era. The Patriots won 15 in a row at one point and Tom Brady has held mastery over Buffalo. Brady is 28-3 overall against the Bills but one loss was the season finale in 2014 where the Pats rested many of their starters and Brady played in the first half. But 2017 is a new year and this Buffalo team is still in the playoff hunt as the season enters Week 13. If the Bills are going to end their own 17-year playoff drought, they’ll have to start taking some of these matchups with New England. A sweep by the Patriots this year would doom any post-season hopes the Bills have. The teams split last year but the Week 4 win in Foxboro last season was against the Patriots #3 QB Jacoby Brissett while Brady was serving his Deflategate suspension and Jimmy Garoppolo was hurt. So, the normally raucous crowd will be even louder this week, since the Bills actually have something to play for this week and it will have the crowd and the team fired up. Defense Regains its Swagger…. “We’re Back”: The Bills defense had been gashed and gashed badly during the three-game losing streak. In the three blowout losses to the Jets, Saints, and Chargers, the Buffalo defense gave up 638 yards rushing. In all of their other games, they allowed just 616 yards on the ground. Last week, they righted the ship and stuffed the Kansas City running game to the tune of just 57 yards on the ground and 236 yards overall in the 16-10 win in Kansas City. The Bills have a young and talented secondary, they’ve gotten very good play from safety Micah Hyde. In the Bills victories earlier in the year, they were generating a ton of turnovers and that’s what they’ll need this week to slow the New England offense and keep up with them scoring wise. Much will have to come from the Bills pass rush which has just 17 sacks on the season. They’ll have to bring pressure on Brady if they’re going to win this one at home. The Offense Still Goes Thru Shady McCoy: McCoy is averaging a very unMcCoy-like 3.9 yards per carry this season. And he had a rough day against the Chiefs defense running for just 49 yards on 22 carries. He leads the team with 758 yards rushing on the season, with four touchdowns, still good for eighth in the league. So, he’ll be amped up for this one in front of the home crowd, especially with things to play for. McCoy leads the team in receptions with 46 as well, far ahead of the next most productive receiver in Charles Clay with 29. So the Patriots focus will be on slowing down McCoy this week. The Patriots run defense hasn’t been great and since Buffalo isn’t a dynamic passing team, they’ll be looking to run the ball with McCoy and Tyrod Taylor scrambling, which will set up their play-action passes and bootlegs to the perimeter of the defense. It is possible that McCoy, who is playing in his ninth NFL season is starting to show some wear on the treads. But the Patriots won’t be looking at him this way and their defense will put him down as the #1 target to slow down. He’s nearly 33 percent of the Bills offense. Buffalo needs a big game from McCoy this week to pull off the upset. Taylor Has To Step Up His Game…Now: Most people don’t believe that the Bills will carry quarterback Tyrod Taylor into the 2018 season. The Bills are figuring him to be gone by then. The fact that they went with rookie Nathan Peterman two weeks ago kind of confirmed that they are looking to upgrade. Taylor can throw a monkey wrench into their plans by giving them a good reason to hold on to him. He can win out, and bring the Bills a playoff berth, something they haven’t done in 17 years. But he’s going to have to step up and be able to put the team on his back, something he hasn’t been able to do in his three seasons at the helm. A look at his stat sheet would put Taylor in the upper half of the NFL’s QB hierarchy. I’d dispute that. Taylor has a good completion percentage and very rarely turns the ball over. They like to roll him out where he can make the safe passes that are right in front of him. And he has the option to run, where he can make plays with his legs. When the Bills running game with McCoy is thriving, he puts up nice numbers. But he’s never been able to show the ability to put the team on his back and win games when the running game has slowed. He plays it safe, checks down too often and is too frequently completing passes short of the sticks on third down. This week and the game in New England later in December, Taylor can help himself out by putting the team on his back. Throwing for an average of 182.5 yards per game and 20 points won’t win many games against New England. The Bills have been outscored in every quarter but the fourth this season…that will have to change and it starts with Taylor. This entry was posted in 2017 Free Agency, 2017 NFL Season, 2017 Patriots Season, NFL News, Patriots Commentary, Patriots News and tagged 2017 Patriots Season, Bill Belichick, Buffalo Bills, Jerry Hughes, Kelvin Benjamin, LeSean McCoy, Matt Milano, Nathan Peterman, New England Patriots, NFL, Patriots, Rob Gronkowski, Sean McDermott, Tom Brady, Tyrod Taylor on November 30, 2017 by Steve Balestrieri. The New England Patriots travel to Buffalo to take on the Bills in a big game for both teams. Kickoff is slated 1:05 p.m. The Patriots (6-1) defeated the Pittsburgh Steelers 27-16 on the road. LeGarrette Blount rushed for 127 yards and Tom Brady threw for 222 yards and a pair of touchdowns. Rob Gronkowski caught five passes for 93 yards and a score. The Bills (4-3) lost to the Miami Dolphins 28-25 in Miami. The Bills blew a 17-6 lead in the second half and allowed RB Jay Ajayi to run for over 200 yards in the loss. Bills RB LeSean McCoy re-injured his hamstring in the game and left after 8 carries. The Patriots and Bills will meet for the 114th time in their history and the second of two divisional matchups in 2016. The Patriots have dominated overall in the series holding a 69-43-1 edge overall. The Patriots hold a 33-22-1 advantage in Buffalo over the course of their rivalry including the last four games played there. The Bills shut out the Patriots 16-0 in the first meeting between the two teams a month ago in Foxboro. It was the first time that the Patriots have been shut out at home since 1993. It was also coincidentally the final game of Tom Brady’s four-game suspension and was started by Jacoby Brissett. This entry was posted in Patriots Commentary, Patriots News and tagged 2016 NFL Season, 2016 Patriots season, Bill Belichick, Buffalo Bills, Chris Hogan, Danny Amendola, Dion Lewis, Dont'a Hightower, Jabaal Sheard, Jacoby Brissett, James White, Julian Edelman, Kyle Williams, LaGarrette Blount, LeSean McCoy, Lorenzo Alexander, Malcolm Butler, Marcel Dareus, Martellus Bennett, Mike Gillislee, New England Patriots, NFL, Patriots edge rushers, predictions, Rex Ryan, Rob Gronkowski, Rob Ninkovich, Robert Woods, Tom Brady, Trey Flowers, Tyrod Taylor, Zach Brown on October 28, 2016 by Steve Balestrieri.